Ottawa Custom Signs can supply the full range of signs that Builders, Property Managers, and Real Estate Sales Professionals require to market their listings. 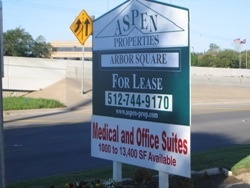 From cost effective screen printed coroplast to digital print aluminum signs to large plywood signage. We can also supply a full range of mounting stakes and frames. To make an enquiry about Yard and Real Estate Signs please contact us now. To order a Yard or Real Estate Sign now please click here.